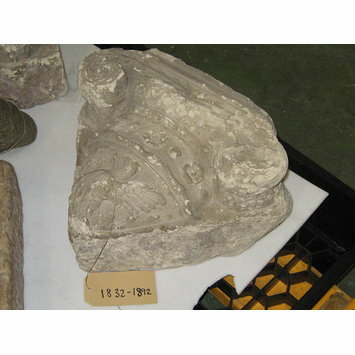 This istrian stone corbel is carved with leafy branches, a guilloche band, rosettes and an eagle with outspread wings. A corbel is a piece of stone jutting out of a wall to carry any superincumbent weight. Corbel. Istrian stone, of Ionic form, carved with leafy branches, a guilloche band, rosettes, and an eagle with outspread wings.